We’ve warned you before in previous videos how giving up your DNA for ancestry tests is a bad idea and now it seems like it could be getting even more invasive. New police technology is now using DNA to create digital sketches of potential criminals. This means your DNA can basically be used to create a facial image that the police can use to recognize you with. Criminals may often attempt to be faceless and leave no trace behind but new technology is gonna try to make it a little bit more difficult. We all know how suspects tend to leave behind dna in one way or another but a company called parabon snapshot is trying to catch suspects by using this to create police sketches. If you sounds cool so far, wait til you hear this. The technology can accurately predict freckling, skin color, the shape of your face, eye color and all sorts of stuff. Something just seems creepy to me guys, let us know what you think in the comment section and if you think something negative can come out of this! They might even start to create sketches of you naked with this kind of technology! Have you ever played paintball before but wanted to step it up to the next level? That’s basically what these pepper ball guns are but instead paint inside the projectile, there’s pepper spray or pepper powder inside! If you thought getting hit by a paintball hurt enough, imagine getting hit by one of these! These will burst on impact and send of cloud of irritants throughout the person’s face. This will cause perpetrators temporary blindness as well as breathing difficulties. They appear to be pretty effective with a decent range too. This man we see in the photo was a robbery suspect in Denver and carrying a pipe. He was told several times to put the weapon down but refused to comply. He was eventually shot in the neck with a pepperball gun and went to the ground immediately. The pepper balls can affect the person who fires it occasionally when the cloud of pepper spray floats in their direction. Riots have been getting out of control lately, so law enforcement figures that maybe if they hose them down a little bit, they’ll get mad their dripping wet and go home. Recently, in the city of Paris, France police have had to bust out the water cannons when violent clashes between protesters and the police broke out. The water cannons are pretty high powered but don’t seem quite as bad as getting pepper sprayed. These are basically like fire trucks that the police use for riots.Other types have been made like that would add electricity to the stream of water, and potentially taser the entire group! 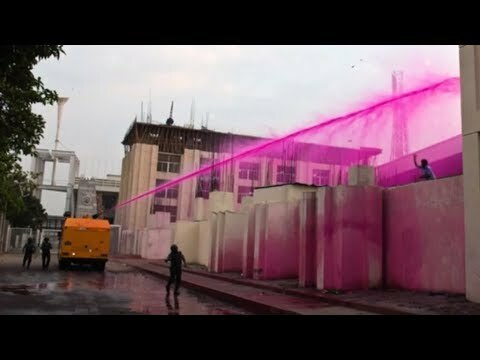 In south Korea, some agencies added pink dye in the mix to help aid them in mark the rioters, making it easier to make arrests. This one here from Germany costs about 1 million dollars each and the German government ordered 78 of them! Each one is made of steel and weighs 33 tons! It’s capable of firing 20 liters of water per second! What do they plan on using all of these vehicles for? And watch where your aiming that thing! You might not be able to see them, but they can certainly see you or detect you at least. You might be familiar with the radar guns that can detect how fast you’re driving, but this radar device can detect if you’re home or not. At least 50 US law enforcement agencies have access to these detection devices that’ll essentially give them x-ray vision before entering a home. Many people like to argue that this device unconstitutional if used without a warrant One of these were used in Denver in 2014, and the judges claimed that such a tool was “poses fourth amendment questions”.